Here is a card that is a lot of fun to do. Not only does the front white angled piece open but so does the yellow piece it reveals. 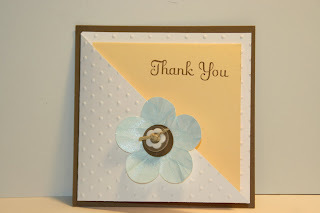 Denise had made this card and she used the "Colored Mist" technique. This technique makes your paper look like it's made of fine silk! All I had left was the photo of this card, I don't have the actual card in front of me to tell you what all was used on here as far as colors go. I'm guessing the background was Soft Suede. The next layer on top of that is Whisper White that was run through the "Dotted Swiss" embossing folder and Sizzix machine. The flower was from a punch. It was crinkled up, straightened out and then sprayed with the "Colo red Mist" and set aside to dry before it was set in place on the card. And the yellow piece looks like it's Barely Banana card stock. The assembly of the card is pretty simple. After you cut your background piece the white piece is cut 1/4" less on two edges after it was embossed and folded in half. The yellow piece was done the same except for the embossing. I'm not sure what set the "Thank you" is from, which tells you that I don't own that set! It's a fun folded card. Almost like getting a present. You open it with great anticipation and find you have another part to open. I just thought it was a cute card and a fun way to open it. Thank you Denise for sharing this card with me and everyone else out there! Tomorrow I am going to start my Julia/Julie stamping "thing." My plan is to go through all the Stampin' Up! stamp sets on my seven shelves and make a card or gift item using each set as I systematically work my way from the top shelf across and all the way down! For those of you who did not see the movie "Julia & Julie," it's about a gal Julie who cooks her way through the Julia Child "The Joy of Cooking" cookbook. She sets her goal to do all the recipes in 365 days and blogs about it. Well, I am not going to be setting a goal to go through all of these stamps in 365 days. I will still be doing projects and other things that I will be posting as I go. My "goal" is to get through all the stamp sets and get rid of the ones I no longer use. I will be posting those that are for sale on the blog and a link to the website for easy purchasing (it figures out shipping and all that stuff - SO simple). SO tomorrow will be the first set in the stack. Whatever theme it is, I will be making a card so don't be shocked if you see cards from holiday's past or ones coming up but are a ways away! I think it will be a fun adventure and a great self-challenge! I look forward to playing with some of these sets again and I will also look forward to letting some of them go as well. Scanning over the shelves and doing a rough count it would take me over a year to go through them all. I am excluding word sets, just image sets. The word sets I hang on to because you never know when those come in handy! Wish me luck on this adventure! And on another fun note. My blog will be reaching the on million hit mark in less than 3000 hits. More than likely sometime this week. I will be giving away some fun blog candy. One of the items will be the "Vintage Vogue" clear mount set from the spring mini catalog that expired at the end of April. It will be fun to see who wins that and all the other things I tend to stuff in the envelope before it gets mailed! SO stay tuned! Very cute thank you card. I love different folds for my cards too. Thanks for sharing this with me. 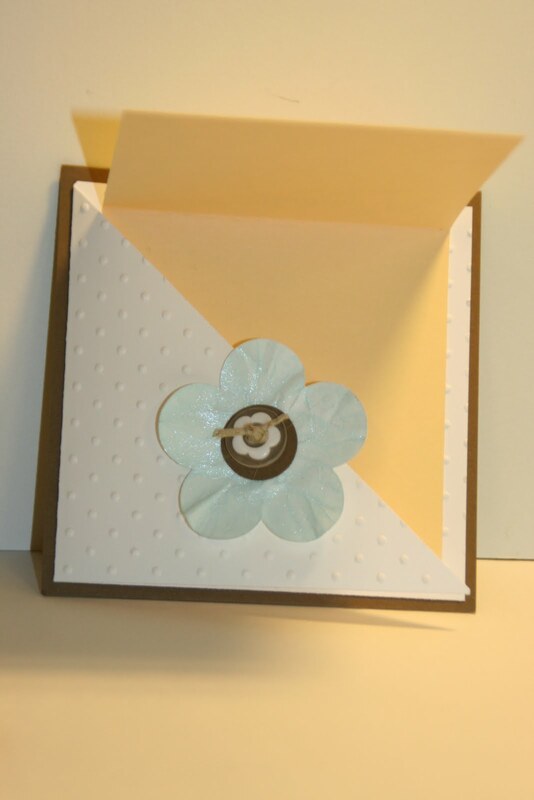 Denise doesn't have a blog where she lists the directions to this card. I will try to get them from her. A very pretty card, and a little different. I like the cards, and like the idea of making a card with each stamp set. I don't have the number of sets you do; but, I am trying to go through and make use of them. I look forward to seeing all of your upcoming projects!